Tarantula Rehousing Tips … With Videos! Nothing gets the old heart pumping quite like a rehousing! With many of my tarantulas outgrowing their current enclosures, I’ve been doing a lot of rehousing as of late. In the last two weeks, I’ve moved about a dozen of my spiders into new homes, and I still have several more to go. When I first got heavily into the hobby, rehousing were something that I used to stress about. After all, the thought of one of these large, fast, sometimes defensive spiders possibly escaping during a botched transfer is enough to the get your adrenaline flowing. Now that I’ve rehoused dozens of Ts, I actually look forward to this activity. Don’t get me wrong, I still remain cautious and very focused whenever moving spiders, but with experience has come some degree of comfort. I used to fear the tarantula getting out of its enclosure; now I recognize that if the spider doesn’t make it directly into its new home, it’s not the end of the world. I’ve also found that I’m able to stay much more calm, which leads to slower, more deliberate movements (and more relaxed animals). When rehousing Ts, there are a few different methods to consider. I have tried all the techniques listed below, and I find that they are all quite good depending on the situation. Experience and experimentation will help you to determine which ones work for you and in which circumstances. The cup method entails simply placing a clear plastic cup over the tarantula, sliding a piece of cardboard beneath the opening, then moving the animal to its new home. You can also tip the cup on its side and use a long instrument like a paintbrush to guide the T into it. Some folks will use deli cups for this procedure, then put the cap on for a safe, secure transfer. This method is particularly useful for larger Ts. The plastic bottle method is also a fantastic and easy way to transfer slings and juvies. Creating your transfer tool is simple; just take a small plastic bottle (I use a 1 liter seltzer bottle) and cut the bottom off. Like the cup method, place the open end of the bottle over your T. Once the spider is inside, either cover the bottom with cardboard or coax it up the side with a paintbrush. With the spider contained, put the bottle in the new enclosure, unscrew the cap, tilt the neck toward where you want the spider to go, and use a paint brush to guide it out the hole. In most cases, the spider will freely move toward the tapered end of the bottle. This is great for directing a spider directly into a pre-dug den or hide. The bag method is a wonderful way to transfer fast or defensive slings and juveniles. It entails placing a clear plastic back over the mouth of your original enclosure and affixing it with a rubber band. After poking a small hole in the bag, you use a paintbrush to coax the critter out of the enclosure and into the bag. Once it’s safely inside, you remove the rubber band and carefully pinch closed the bag, being careful to keep your hand away from the spider (they can bite through the plastic). Finally, just put the end of the bag in the new enclosure and carefully maneuver the spider out of the back and into its new home. Like most aspects of this hobby, reading about transfers and rehousings only gets you so far. To get comfortable with them, it really takes experience. Keeping that in mind, here are some tips to think about before rehousing. When rehousing, make sure that you have a clear, clutter-free area in which to work. I use my dinner table and try to clean as much off of it as possible. Make sure that pets or small children are safely out of the way. I have three dogs and a younger child, and I always make sure that they are all out of the room when I work. Many keepers also recommend attempting transfers on colder mornings, as the spiders will be a bit less lively and likely to bolt. If you try a transfer, and the T demonstrates its agitation by running around or displaying aggressive behavior, STOP and try again later. There is no need to make the experience more difficult for yourself (and more stressful for the T). You should assume the spider will get out, and prepare accordingly. Negotiating your hands and tools into small enclosures can put you more at risk for a bite. Sometimes it’s simpler to gently coax the spider out onto a table so that you can easily and safely cup it. I’ve found that assuming the spider will get out makes the transfer much less stressful. When possible, you can always leave an older enclosure in the new one if it will fit inside. This way, the tarantula can come out when it is ready. Be warned, though, that some never want to leave! And, above all, stay calm and move slowly. Yes, I know that it’s difficult to stay cool when a large T is attacking your paintbrush, but you don’t want to lose your composure. If something doesn’t go as plan, take a deep breath, try to relax, and keep your eye on the tarantula at all times. It’s very important to be totally prepared when performing a transfer. I like to keep the following tools and materials on hand. Several clear plastic cups, various sizes – I always have multiple “catch cups” on hand, ready to go if a T should try to bolt. A plastic bottle with the bottom cut off – These are GREAT for smaller Ts. Long tongs and paintbrushes – I always have a pair of 8″ and 12″ tongs on hand to help in the process. They can be used to move hides, dishes, and substrates. Paintbrushes are also excellent tools to use to coax Ts out. Small dish towels – These work wonderfully as hiding spots for a bolting T. I like to spread them around my work area so that if a spider bolts, it will likely take refuge under one of these “spider traps”. Pieces of cardboard – Cut some cardboard to size so that you can use the pieces to cover up the bottom of the cup or bottle to hold the T inside. Spoons – These can be handy when you have to dig a species out. Just be careful not to injure the T, and be prepared for an agitated tarantula to burst from its den. Large, shallow Sterilite container – This one is optional, but I like to put the enclosures I’ll be using inside a large plastic storage bin. The bin I use is shallow, allowing for me to easily work. This gives me an added barrier if a T should happen to get out. You can see the one I used in the videos below. Four transfers, four very different experiences. Today, I planned to move four different tarantulas: my juvenile A. brocklehursti and my three juvenile Phormictopus sp. purple juveniles. My brock has traditionally been a bit skittish, but has never been defensive. My purples, on the other hand, can be little terrors. I’ve seen more threat postures from this trio than any of my other species. They are quite feisty, and it doesn’t take too much to rile them up. With the potential for some exciting and unpredictable action, I decided that it would be a good time to break out the camera. My 1o-year-old daughter, Sidney was kind enough to man the camera for me so that we could catch all of the action. Although I’ve done many “easy” transfers, where the spider is quickly moved without incident, I wanted to possibly capture a rehousing that didn’t quite go so smoothly. After all, switching enclosures can be quite tricky, and spiders can act unpredictably. You need to be prepared for anything. My A. brocklehursti transfer went about as smoothly as a transfer can go. I mean, this little guy didn’t even need to be prodded out of the bottle; he just plopped down on his own! As my Phormictopus sp. purple juveniles are quite feisty, I expected that rehousing these guys could be a bit of an adventure. Well, the first transfer went quite smoothly, and the little guy cooperated for the most part. How do you set off a defensive species? Well, just drop a little dirt on it. This rehousing doesn’t quite go as planned as a bit of stray dirt riles up my second purple juvenile. Despite the inauspicious beginning (and some spider on paintbrush violence), he makes it into his new home. This stubborn little guy does NOT want to cooperate at first, and it takes a bit of patience and finagling to finally get him into his new home. Of course, he first has to get a piece of that paintbrush. If you watch closely when he attacks, you’ll see why I NEVER hold my tarantulas. Had that been my hand, I would have flicked him into the air. For those looking to rehouse a fast and feisty arboreal, here is a video featuring my P. hanumavilasumica. As I’ve received several questions about how I go about rehousing fast-and-feisty fossorial species, I’m adding a couple movies to this tutorial. What follows are rehousing videos for my H. Gigas and O. philippinus, both species that built dens deep in the substrate. Now that I’ve got a tarantula, how do I go about feeding it? Whether you have a dog, a cat, a hamster, or a pot-bellied pig, if you’re a pet owner, you’ve become accustomed to certain standards of care for your wards. For those of us who have kept these more domesticated pets, we are very used to feeding and providing fresh water to our pets daily, often more than once, and having a variety of conveniently-packaged foods available for their consumption. Most of these pet foods come with handy instructions on just how much to feed your pet, dependent upon the size of the animal. When our furry little friend doesn’t eat for a couple days, we take it as an immediate sign that something is very wrong and seek veterinary care. Well, now you own a tarantula, and suddenly, all of the rules you’ve learned about pet care go right out the window. 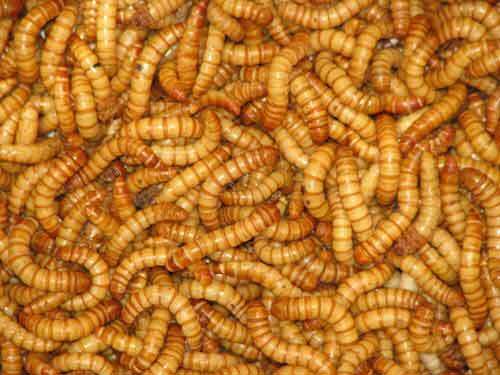 No one sells “Tarantula Chow”, and there are a plethora of feeder insect that would make a good meal for your new pet. There are no “portions”, and determining what size item to drop in with your hungry spider can be cause for stress. As for a feeding schedule, some healthy adult species only need to be fed once a week. And if your T doesn’t eat for a while, it is no cause for immediately alarm. This is an animal that can go months at a time without eating and still stay healthy. Tarantulas don’t come with instructions, and learning some of the rules and tricks around feeding them can be a stressful and tricky endeavor that involves experience and research. The message boards are often full of posts by newbies asking feeding-related questions like, “How often should I feed?” or “What size item should I offer?” Here, I hope to answer some of the most asked questions and give those new to the hobby one less thing to stress about. There are a few important points to consider when coming up with a feeding schedule. The life stage of the tarantula, the size of the prey you are feeding it, and the species you are feeding should all be carefully considered when devising any sort of feeding schedule. Younger tarantulas, like slings and juveniles, are doing a lot of growing and are much more vulnerable than their adult counterparts. Slings are particularly fragile, and keepers report more sudden and unexplained deaths in the sling stage than in adults. In the wild, a spiderling is particularly vulnerable to predators early in life, so it behooves the young T to eat as much as possible as often as possible so it can quickly grow out of this precarious stage. Therefore, most keepers choose to feed their slings as often as they’ll eat. For many, a feeding schedule of every two or three days for slings is perfect. However, if they are being offered a large prey item, once a week will certainly work. A lot of folks express concern that they can overfeed a sling. 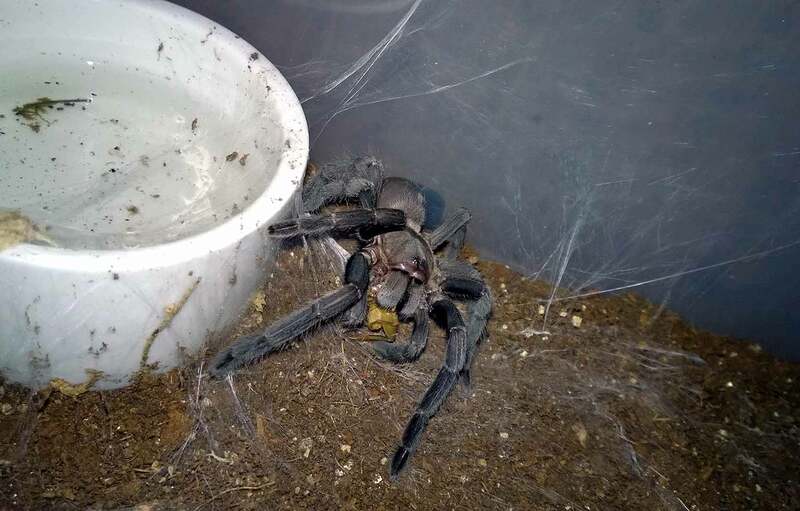 Although some have insisted that a tarantula can become too fat, resulting in organ failure and molting issues, there has been no scientific proof of this, and most keepers believe it to be a myth. Most slings will chow down until they are ready to enter premolt, then they will stop. They will NOT eat until they explode. The only danger posed to a fat T is a possible abdomen rupture from a fall. Once the tarantula reaches the “juvenile” stage at around 1.5-2″ or so, most keepers ease off on the feeding a bit. A spider of this size is usually out of its fragile sling stage, and growth at this point will slow down a bit. Although you can certainly continue with a more aggressive feeding schedule at this point (see “power feeding” below), it is no longer necessary. At this stage, I usually feed my animals a larger prey item once or twice a week. For adult tarantulas, you need to also consider the species before settling on frequency. An adult Grammostola porterie/rosea needs only four or five crickets a month to be healthy. Conversely, an adult Therophosa or Pamphobeteus species would eat that in a single meal a couple times a week. Generally, the feisty tropical genera (Therophosa, Phormictopus, Pamphobeteus, Acanthoscurria, Nhandu, etc.) will need larger and more frequent meals. As an example, my 6″ Pamphobeteus antinous female eats five crickets and one 1.5″ dubia roach in a single week. 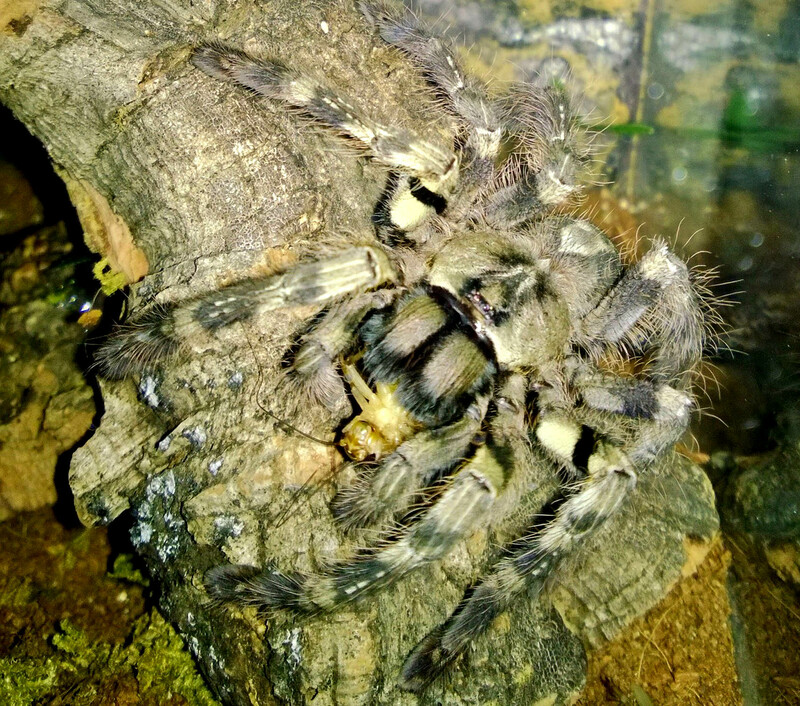 My 6″ female G. porteri, on the other hand, eats four crickets a month. Both species are healthy and plump, but the feeding schedule for one would definitely not work for the other. Know the species of T you keep and listen to other keepers about its appetite. If you have questions, ask. Observe the feeding responses and growth rates to determine if more or less is needed. A word about “power feeding”. If you’re around the hobby long enough, you’ll hear folks talk about “power feeding” their tarantulas. Power feeding is when the keeper jacks up the heat and feeds his tarantulas as much as they will eat in order to grow them to maturity faster. This is usually done in an effort to get breedable adults as quickly as possible. Although this could shorten a tarantula’s lifespan as it is rushed through various instars (some males may mature in less than a year), there is no proof that this is harmful for the T.
II. What size feeders to use? The size of the feeder being given to the tarantula can certainly impact the frequency that you feed the animal. Some keepers choose to feed their specimens smaller prey items more often. Others will offer their Ts much larger insects, then feed them only once a week or so. There is really not any right or wrong way, and the size and schedule comes down to the keeper’s discretion. Personally, I tend to feed medium-sized items a couple times a week. Many keepers stress about the size of prey they should offer to their spiders. A rule of thumb many keepers use is that the prey item should be no larger than the abdomen of the tarantula. So, a juvenile with a abdomen length of about 5 mm would likely be comfortable with a pinhead cricket. Personally, I feed my slings and juveniles prey items slightly smaller than the total length of their bodies, and adults I feed items no larger than their abdomens. I’ve found that this works very well for me, although it is by no means law. Again, it comes down to the personal preference of the keeper. When in doubt, it makes sense to err on the side of caution and give your T smaller, more manageable prey. Now, these are just guidelines, and it is okay for keepers to deviate from them. Case in point, some species of Ts will actually only attack smaller prey items. My M. balfouri and H. incei gold juveniles, for example, would only take much smaller prey for the longest time. Even when my balfouri juvies were about 1.75 inches, they would only attack small crickets. Conversely, my P. cancerides juveniles would easily take down sub-adult crickets at that size. Observe your Ts and their feeding habits, and feel free to go up or down a prey size as needed. What to do for tiny slings? For very small slings (1/4-3/8″ or so) small food can be very difficult to come by. Although B. lateralis roach nymphs can be a good alternative due to their small size, they are not always easy to come by. In these instances, it may be necessary to pre-kill and cut up a larger prey item into a more appropriate size. Spiderlings will scavenge feed, so this is a great way to make sure that they can eat as much as they want while not putting them in danger by dropping in an overly-large prey item. Although this may sound a bit gross (and, well, it really is! ), cutting the leg off of a larger cricket, or cutting a meal worm into smaller pieces is a perfect way to feed your tiny sling. Just carefully place the food chunk in the enclosure and, if the sling is hungry, it will find it. Just be sure to remove any excess the next day, as they may not consume the whole piece. If they don’t finish the item, you might want to wait several days before offering another item. III. How many items should I feed at a time? In the cases of slings and juveniles, I would say one prey item per feeding is completely appropriate. At this size, they usually have their hands full with an appropriately-sized food item, and adding a second would only serve to stress the animal. For some adults, dropping in a more than one item can be an appropriate option. Personally, I tend to use larger insects, like dubia roaches, rather than bombard my tarantulas with a half-dozen spastic crickets. I’ve also seen animals become visibly agitated when more than one item is dropped in. If you do drop in multiples, be sure anything that isn’t eaten is removed in a timely manner and that animal seems comfortable with taking down multiple feeders. IV. What are my feeder options? There are many possibilities when deciding what to feed your Ts. Personally, I find the many inverts available as feeders to be quite convenient, and I will often mix up what I feed my spiders to create a more diverse diet. Here are some of the more common feeder insects available as well as some pros and cons for each. NOTE: Some folks supplement their larger tarantulas’ diets with vertebrates such as mice, geckos, and snakes. Personally, I’m not a fan of this. Besides being a rough death for the vertebrates, the mess left behind after the tarantula feeds can be a perfect breeding ground for bacteria and pests. 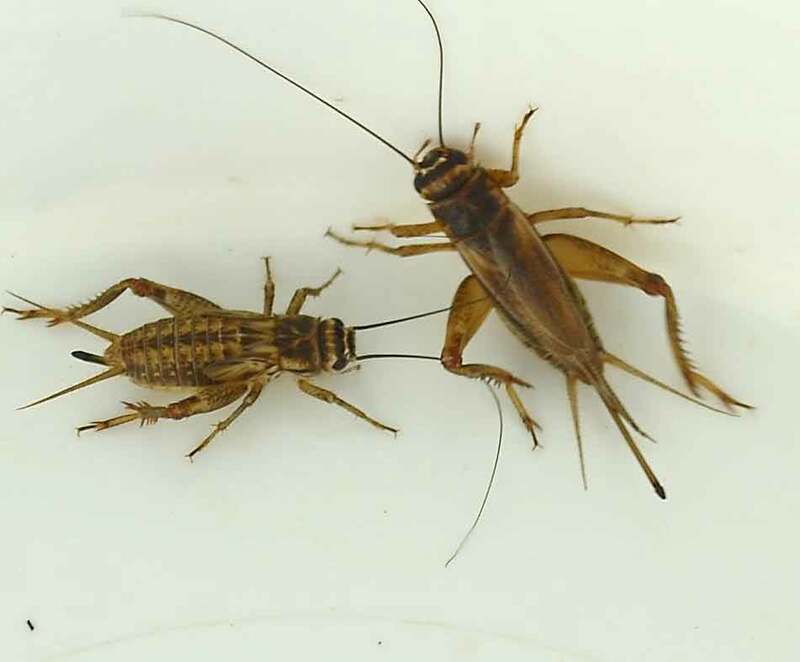 Crickets: Crickets have long been the go-to feeder insect in the hobby. They are sold at most pet stores in several sizes that make them a convenient feeder insect for almost any size T, and they can be purchased in bulk for those with large collections. They can also be relatively inexpensive if purchased in large quantities. TIP: To keep extras alive, use a large critter keeper or modified plastic storage container, provide egg cartons for a hide, and feed dry oats or fish food. Humidity kills them, so I supply slices of potato for moisture. Mealworms: Another readily-available food source for tarantulas. Not only can mealworms be purchased in many different sizes, but they can also be raised rather easily. Unlike other prey items on this list, they can be kept in a refrigerator, meaning you can keep some on hand for when you need them. They are also very easy to reproduce and raise (for a tutorial on how to start a colony, click away!). TIP: These are a prey item that will dig (often to return later as a black beetle that the T won’t eat), so I will often crush the heads before dropping them in to keep them from burrowing. Can burrow and disappear if given the chance. 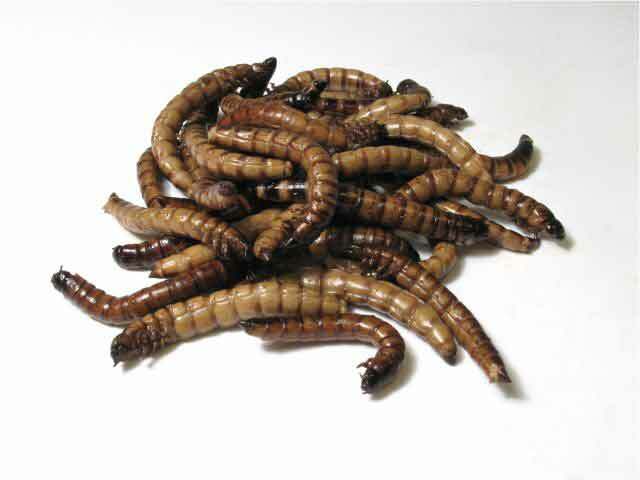 Superworms: Like mealworms, superworms are another beetle larvae that can make for a good tarantula feeder. They are relatively inexpensive, and their larger sizes make them a better choice for larger Ts. They can also be raised and bred in colonies for those interested in always keeping some on hand. However, it needs to be mentioned that these worms WILL bite and eat a tarantula. TIP: To prevent a superworm from injuring or killing a T, either cut off or crush its head before offering it. 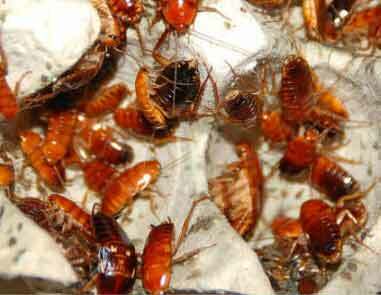 B. lateralis roaches: Also known as “rusty reds” or “red racers”, these roaches make a wonderful alternative to crickets. They are fast moving, bold little bugs that will stay out in the open rather than dig. Their propensity to explore and move around when dropped into an enclosure makes them a very attractive prey item for Ts. Adults are also a bit larger than crickets, making them a little better for larger Ts. These can be purchased online in bulk, or kept in colonies. 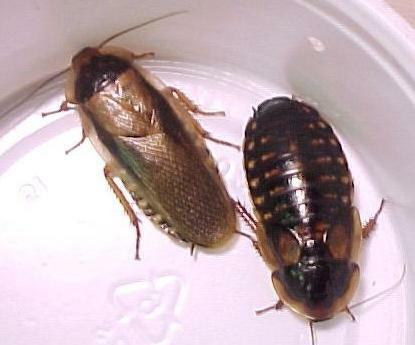 TIP: These are fast little roaches who are quite good at escaping when given the chance. Unlike the next roach on this list, given the right conditions, this one could thrive and be a pest in the home. B. dubia roaches: This tropic roach species can hit sizes of 1.5-2″ making them a great feeder choice for larger tarantulas (I feed most of my large tropical species with B. dubia). They can be purchased as colonies (about $30 shipped), which will produce nymphs of many sizes, providing a food source for slings, juvies, and adults. The one main drawback to this species is that some tarantulas won’t take them. TIP: This roach will freeze and “play dead” when a tarantula approaches, often leading to the T passing it up. They can also dig and hide (I’ve had ones I thought were eaten reappear months later). To prevent either of these scenarios, crush their heads before dropping them in. This will cause them to wander aimlessly keep them from burrowing and playing dead. These are just a handful of the feeder options available, and some ones that I have experience with. I know hobbyists in the UK often use locusts, which sound like a fantastic food source. There are also waxworms, earthworms, Madagascar hissing cockroaches, and lobster roaches. Feel free to experiment with any or all of the available feeders; a diverse diet is always a good thing. For a wonderful article about some pros and cons of crickets, B. dubia, and B. lateralis roaches, check out A Roach in a Coach is Still … Food ! V. How to feed your tarantula in three easy steps! OPEN the enclosure – Be sure to know where your T is when you take this step, and only open the enclosure as much as you have to. Drop in the prey item – You don’t have to hold it in front of the T or make it dance with tongs. Just drop it in! CLOSE the enclosure – Make sure the cage in securely latched and closed. Congratulations, your tarantula has been fed! All joking aside, there is no need to do anything other than what is described above. This is an animal that has evolved over millions of years; they wouldn’t have made it this far if they couldn’t figure out how to eat. Tarantulas are excellent hunters and, in most circumstances, they will have no problems detecting and snatching prey. Don’t worry about dropping the feeder right next to the spider either, as you will chance startling the T. I like to drop it across the enclosure from the tarantula to give it a chance to detect the prey animal and to get a chance to hunt. It is quite fascinating to see how the different species go about capturing their food. It worth it to note that many tarantulas are nocturnal, so you may want to do your feedings at night before bed. If the feeder hasn’t been consumed by the next morning, remove it. That being said, I feed the majority of mine in the afternoon, and I’ve seen the majority of them, even the “pet holes”, eat. VI. But what if it doesn’t eat? If your specimen starts refusing meals, don’t panic. Tarantulas will often refuse food during premolt (read about premolt here), and some species will fast for long periods of time. This is an animal that can go months without eating and still remain healthy, so missed meals are no reason to freak out. When a T isn’t eating, don’t keep dropping bugs in with it every day. Instead, wait a week or two, drop in a prey item, and watch to see if there is any interest. If the T doesn’t eat, take the item out and try again in another week. Always make sure that fresh water is available. VII. Tongs are for maintenance! Finally, in most instances, there is no need to tong-feed your tarantula. I hear so many people new to the hobby using tongs to essentially hand-feed their animals. In most cases, this is completely unnecessary and serves only to put the keeper and the T in danger. Not only can a spider injure a fang if it attacks the tongs, but they’ve been known to run up tongs to escape or bite their owners. 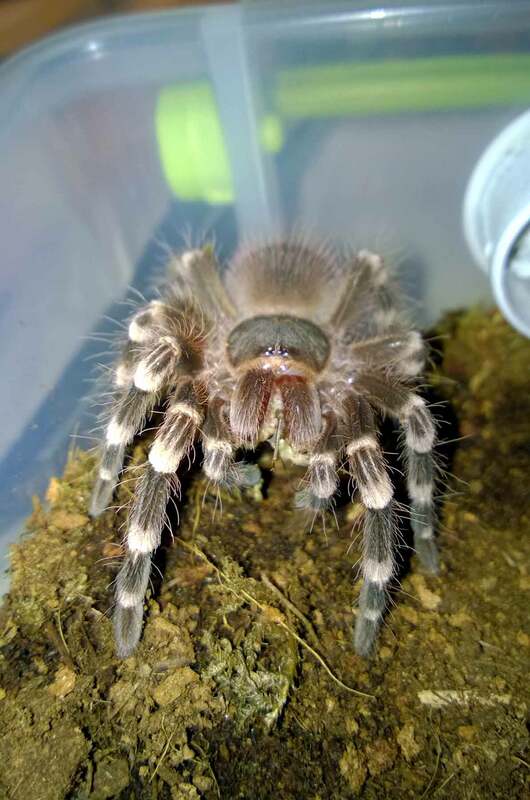 And, as someone who keeps feisty and fast Old World tarantulas, trust me when I tell you that you don’t want to try tong feeding an OBT or a pokie! This is a hobby in which research and, more importantly, experience brings confidence. Although many of the issues one might encounter when feeding have been addressed above, there are always situations that pop up that might be unusual or rare. Luckily, there are forums and sites like this one that you can go to for help and guidance. Before you panic, though, always remember that tarantulas are tough, adaptive animals that have survived millions of years of evolution and, sometimes, questionable husbandry.